While Newton Central is in the heart of the inner city, we are proud to have one of the most dense flora and fauna locations around. This is largely due to the commitment of our property manager Ross Lay, and the support of both past and present community members. Our ngahere is a designated  ‘Inner City Forest’  providing our community with a bounty of taonga. It supports the reduction of the effects of car pollutants and regeneration of indigenous species of plant, bird and insect life. Our forest development commenced in 1993 with a whakatuwhera (blessing) and celebration by kaumātua from both Ngāti Whātua and Tainui iwi and by the local school community. Our forest is part of our school’s everyday life, a place for learning, growing and connecting. Each child that has attended the school has planted a tree either individually, with friends, family and the wider community. New students bring a tree to plant and watch it grow as they do. It will stand as a tribute to their contribution to sustaining the earth and our future. We only take sticks from the big pile at the top of the stairs or through trading. I tell the truth about my hut and sticks. Sticks are for building and trading only. I respect my hut and others’ huts. I follow the ‘hut treaty’ agreement. 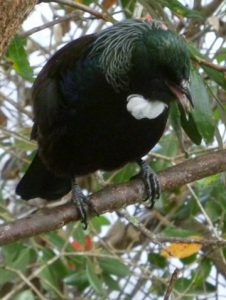 Our school community are privileged to be submerged in a bounty of fauna and flora canopy in inner city Auckland. Scattered throughout the school site are gardens, giant pōhutukawa, kōwhai and many other natives trees.